A Way Out was one of the biggest surprises of the EA press conference. An indie title made by the designer behind Brothers: A Tale of Two Sons, it is a co-op narrative game that puts players in the shoes of two convicts on the run. After playing a short session, the game shows promise. The game stars Vincent and Leo, two prisoners, as they break their way out of prison and deal with the resulting manhunt. I played it in a session with a partner, guided along by game director Josef Fares. 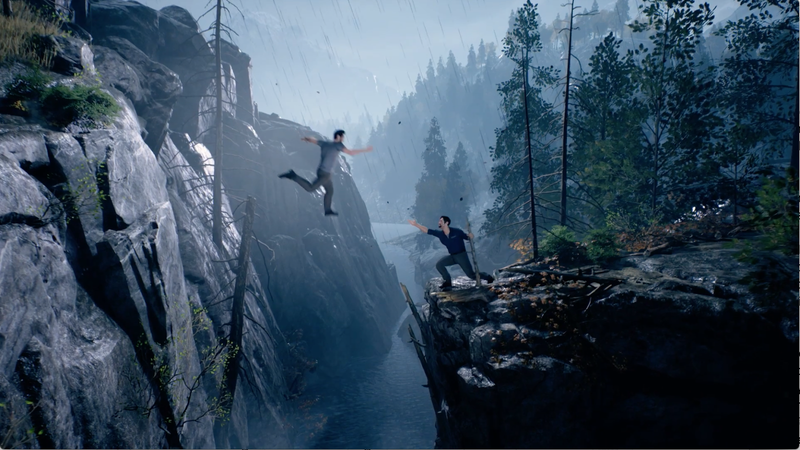 A Way Out is only playable in cooperative mode, either through couch co-op or online multiplayer—two players must always play Vincent and Leo throughout a session. The coordination makes for some intricate co-op experiences. The demo I played lasted a little over five minutes and tossed me into a quick scenario: having busted out of prison, Vincent and Leo decide to rob a gas station for some much-needed cash. I played as Vincent, the more level-headed of the two characters, and alongside a fellow journalist, we had to decide who would carry the gun needed for the robbery. I deferred and said they could, but they nervously insisted that I take the weapon. In the end, we talked out our plan: he would take the gun and I would scout out the gas station store ahead of time. It worked out pretty well. As my partner talked with an NPC outside, I was able to wander into the store and take small steps to ensure things would go in our favor. I sabotaged a phone and even convinced one customer to leave through some fast talk. A Way Out makes all of these interactions simple. The majority of these actions were handled with a single button press, which did different actions in different contexts while dialog was largely a series of binary options on a tree. In many ways, the small moments of decision-making in A Way Out recall what you might find in a David Cage game like Heavy Rain. While my partner held up the cashier, I absentmindedly forgot to check on another customer. It resulted in a limited amount of time to crack the store’s safe and get out of there. It was tense, but we got away. It’s a bold statement, but Fares does seem to be willing to risk himself for the project, going so far as to share footage of him and his brother performing motion capture for one of the game’s action sequences on his cell phone to Kotaku. Another sequence showed an escape from a hospital, with stretches focusing on a single character that shifted from one player to the next through sustained camera movements. A fight in a hallway changed to a chase sequence when the camera dove through an air duct to the other player’s location without any cuts. It’s the type of cinematic presentation you might expect from a designer like Fares, who has a background as a film director. Fares told Kotaku that while the initial prison break would be a large portion of the game, A Way Out would also seek to guide players from one experience to the next, moving from set piece to set piece. It’s unclear to what degree players will be able to shape the overall story, but Fares was emphatic about maintaining a clear tone and characterization throughout the game.